In the future, technology allows for facsimiles of the deceased to return in the form of intelligent holograms. Though best known for dabbling in the horror genre with his cult 1994 vampire drama Nadja and transplanting Shakespeare to modern day America with 2000's Hamlet and 2014's Cymbeline, writer-director Michael Almereyda is recognised by sci-fi fans chiefly for penning the screenplay for Steve De Jarnatt's futuristic satire Cherry 2000. Largely dismissed as a ludicrous fantasy on its 1987 release, De Jarnatt and Almereyda's film has proven somewhat prophetic, predicting the increasingly mechanised and dehumanised world of human relationships we now find ourselves in. In that movie, those seeking a romantic connection have two options - they can negotiate a bureaucratic dating system which involves presenting a potential partner with a CV and references from former lovers, or they can simply purchase an android mate. With Marjorie Prime, his adaptation of Jordan Harrison's Pulitzer Prize nominated play, Almereyda returns to the territory of Cherry 2000, continuing to question what constitutes a human connection. 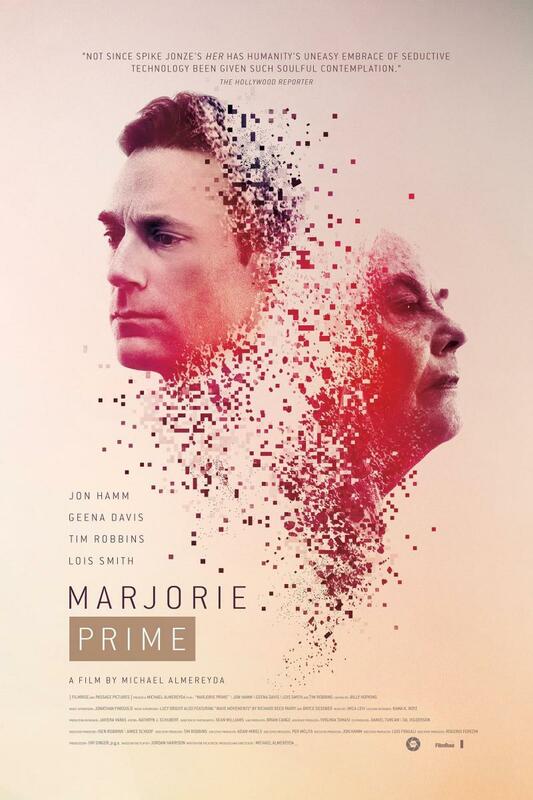 Set in a near future, not unlike the present day but with the usual translucent smartphones (apparently nobody cares about privacy in the future), Marjorie Prime posits a world where technology allows the bereaved to be reunited with deceased loved ones in the form of intelligent, sophisticated and life-like holograms known as 'Primes'. 86-year-old Marjorie (Lois Smith) lives with her daughter Tess (Geena Davis), her son-in-law Jon (Tim Robbins), and a Prime of her late husband Walter (Jon Hamm). Marjorie has opted to have her hubby return as he appeared in his forties, when she was in her twenties, at the beginning of their relationship, a subtly damning and cynical comment about the nature of attraction. The trouble with Primes is that, like any technology, they require programming. Out of the box they're somewhat sentient, but their memories must be fed by those who knew the now departed person whose place they have taken. As the film points out, memories are subjective and untrustworthy, and so while Marjorie fills Walter Prime's head with nothing but the selective highlights of their life together, Jon's interactions with the holographic representation of his estranged father-in-law are far more honest and confrontational, as he seeks answers the Prime is unequipped to provide. Thematically, Marjorie Prime completes a loose trilogy with Wim Wenders' Almereyda scripted Until the End of the World and Almereyda's 2015 dramatisation of the Stanley Milgram experiments, Experimenter. All three films involve characters probing around inside the heads of others, whether to record dreams, foster obediency or fill a false human with unreliable memories. While sci-fi is the most fitting genre for allegorical storytelling, cinema isn't always the best fit for allegorical sci-fi. Marjorie Prime makes an interesting point - that memories may not be reliable, but at least they belong solely to us (something anyone who gets irritated by those people who whip out recording devices at live events and experience it through a screen will nod along with) - but it makes its point relatively early on, and subsequently struggles to justify its feature length. The theatrical three act structure boils down to three variations of the same setup, with a surviving human conducting a sort of reverse interrogation on a Prime of a recently deceased family member. Charlie Brooker delivered a more satisfyingly paced version of essentially the same idea in half the length of time with his Black Mirror episode 'Be Right Back'. Almereyda's film is the very definition of a filmed play, with the conversational structure broken only by end of act montages of Malickian shots of nature accompanied by a melancholy Mica Levi score. Thankfully he's cast his talking heads well, plucking the veteran Smith from the off-Broadway production of the original play. Casting an 86-year-old in the role adds a touching authenticity to Marjorie that couldn't be faked with make-up or prosthetics. While the feelgood factor may win Smith an awards nomination or two in the coming months, it's Davis who is the real standout here, and the film is as much about a 60-year-old woman confronting her impending 'old age' as it is her octogenarian mother facing her demise. Davis may look better than most women half her age, but in Hollywood terms she's already at the end of her career. Seeing her deliver what may be one of the last meaty roles she's awarded is perhaps the saddest part of Almereyda's lugubrious film. 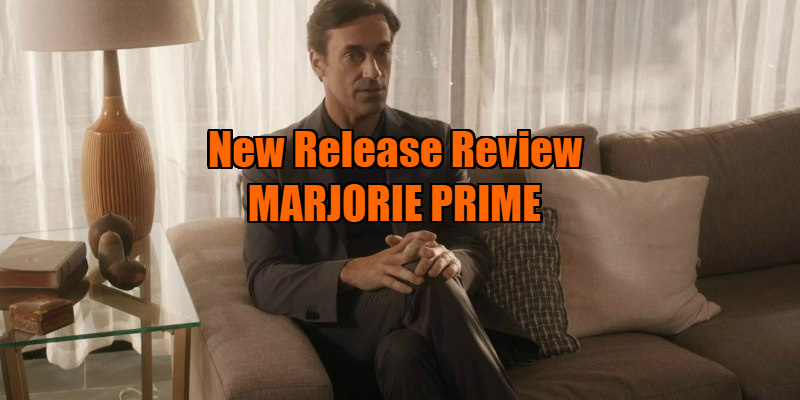 Marjorie Prime is in UK cinemas November 10th.